Forum Index > Historical Arms Talk > Two-handed falchion at XVth beginning ? Posted: Wed 18 Jan, 2012 11:11 am Post subject: Two-handed falchion at XVth beginning ? Did it have two handed falchion at the beginning of the XVth century ? Most people will answer "No, but at the beginning of the XVIth century, you have grossemesser etc..." or something like that. It's ok.
What do you thing about that ? We have some very interesting depictions here and there, but usually nothing more substantial, unfortunately. My two cent's worth, for what it's worth Yes..manuscript illustrations are often artist's *imagination*, and shouldn't be taken as literally correct, or true. But much of what we know of medieval life is derived from these illustrations. There are several threads here discussing how swords were suspendedt a particular period, and much of what folk claim as correct is derived from manuscript illustration, and backed up by illustrations. Are we to accept that illustrations showing different suspension systems are correct..and yet reject similar illustrations showing weapons with as-yet-undocumented surviving examples ?? You can't have your cake, and eat it too. Several of the manuscript illustrations shown at the start of this thread clearly show longish, falchion-like swords being wielded two handed and are of the period the author is questioning..the early XVth C. So I'd say Yes..there were 2 handed , falchion-like swords around at the time. I'm not suggesting they were common, lack of actual, surviving weapons makes it likely they were fairly uncommon. Do you have more informations about this one ? Any photography ? I don't know if anybody has learned any more about this. I checked the museum site at the time of that link and didn't find it. I don't know if anybody has tried to contact the museum, but if you contact them and get some information, please share it with us! Wow, I love that. Thanks for posting. You wouldnt happen to have more pictures of that one would you? Do you know how long it is? Does any recognize any of the other pieces in Elnar's picture above well enough to estimate the size of that two hander? At the bottom appears to be sturups. What are they, 5/6 inches across? Sorry to dig up this topic from grave after like 4 years - but lately I got some news about the Cordoba falchion. There exist, however, in the archaeological museum of Córdoba a falchion of a different type (Fig. 73), excellent in regard to conservation, found near to Córdoba in river Genil. This sword has a facetted pear-shaped pommel, horizontal and slightly S-shaped quillons and a long, solid single-edged blade, terminating in a yelman. 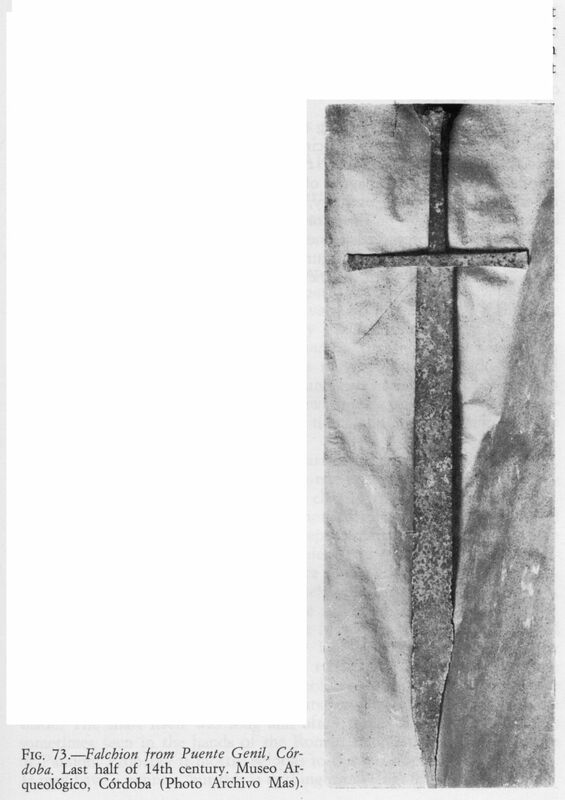 In regard to blade it corresponds well with the so-called Thorpe-falchion in the Castle Museum of Norwich. This type of falchion, different to the Durham and the Catalan especimens, is probably—as said by Mr. R. Ewart Oakeshott about the Thorpe-falchion—of eastern origin. 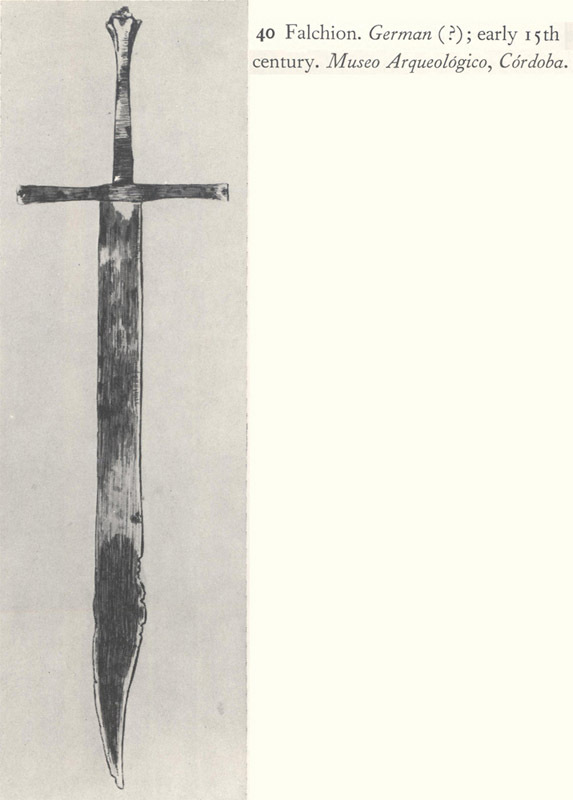 In regard to chronology of the Córdoba-falchion, its pommel and quillons indicate a period about the end of the 14th century. After that I decided to contact the Cordoba Archaeological Museum, asking for a picture. They sent me one, but unfortunately it was by the "official" and administrative way, and I'm not sure to be legally allowed to show it here. But there is a scale near the falchion on the picture, and total length can be estimated to ca. 92cm (with 70cm for blade, that was originally certainly around 72-73cm because of the broken tip). So it looks like it was indeed a falchion that could be used with both hands!